To understand what’s happened and why, some perspective is valuable. For good or ill, America is living through a period that I would describe as a second gilded age. Somehow, in spite of lackluster growth by historical standards, the 21st-century American economy has managed to produce markedly more wealth for its elite, even as it generated markedly less employment for its workers. Between the third quarter of 2000 and third quarter of 2016, household and nonprofit net worth soared from $44 trillion to just over $90 trillion, while the work rate (for both genders combined) fell by five percentage points — levels last recorded three decades earlier. That contrast offers insight into a number of overarching features of our time, including rising sentiments of anger and despair — and the increasing attraction of both right- and left-wing populism. It also helps to explain why majorities in public opinion surveys tell pollsters that America is still stuck in the midst of a recession in spite of the reality that the officially recorded unemployment rate (4.7 percent as of January 2017) is close to the record lows enjoyed in 2000. However problematic America’s employment profile may appear to the unaided eye, trends for America’s men are yet more dismal. 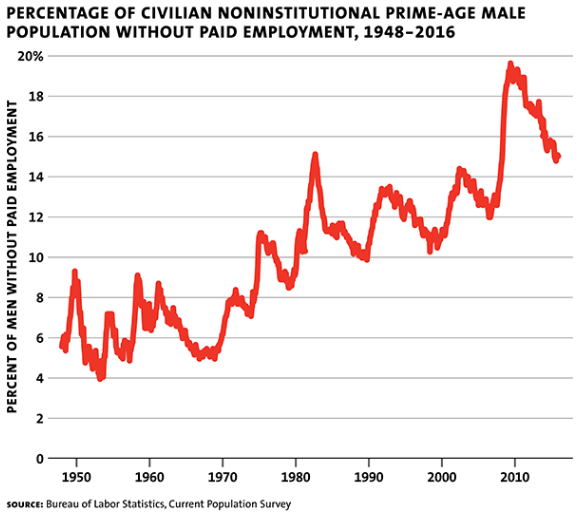 And the cloud is hardly a passing one: Between 1948 and 2015, the work rate for men 20 and older (all postwar employment data are for the civilian noninstitutionalized population) fell from 85.8 percent to 68.2 percent — a drop of almost 18 percentage points. To put it another way: while many economists argue that the economy is currently at or near “full employment,” the work rate for men 20 and older was over a fifth lower than it was in 1948. Of course, this particular measure includes men 65 and older — that is, those of traditional retirement age. But the trend doesn’t look very different when the rapidly growing 65-plus population is eliminated from the reckoning. By 2015, nearly 22 percent of the age 20-to-64 group of men was reportedly not engaged in paid work of any kind. This was nearly 12.5 percentage points more than the 1948 level — meaning the fraction of men ages 20-64 not at work was more than twice as high in 2015 as in 1948. As for prime-age men — the 25-54 group, the segment for whom paid employment has always been highest — work rates sank almost 10 percentage points in the same period, from 94.1 percent to 84.3 percent. Here’s another way of thinking about the current work deficit for men. One reasonable benchmark for measuring that gap is the mid-1960s, when U.S. labor markets were apparently functioning at genuinely full employment levels. If age-specific work rates had simply held constant from 1965 to today, another 10.5 million men age 20-to-64 would have had jobs in 2015 — including an additional 6 million in the prime 25-to-54 group. Yes, there is one important respect in which the 10.5 million figure overstates today’s work deficit. It does not take into account the steady increase in education and training for adult men over the past five decades. But the magnitude of the relevant adjustment is not especially comforting. Census Bureau data suggest that adult schooling currently takes about a million more working-age men out of paid employment than if 1965-era adult enrollment ratios still prevailed. So the corrected gap for 2015 is “only” 9.5 million male jobs. The devastating drop in employment for American men over the past two generations presents us with something of a dog-not-barking question. How can so many millions be absent from payrolls with so little consequent sociopolitical upheaval? 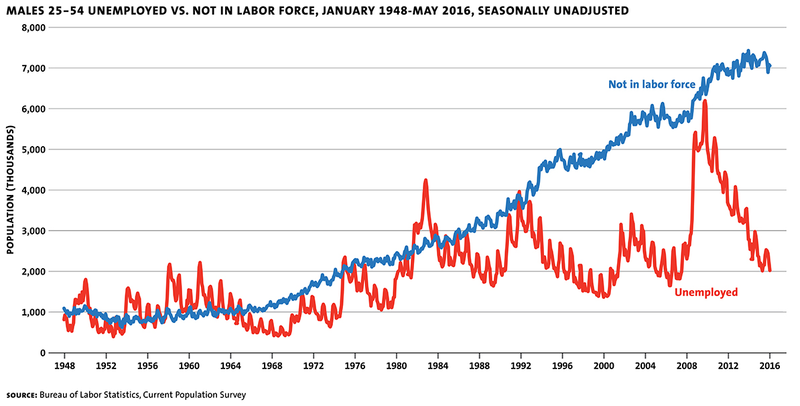 Two big postwar changes in the American labor market suggest the answer. The first was the epochal transformation in the nature of women’s work. Before World War II, the exclusive economic activity for the overwhelming majority of American women was unpaid labor at home. Today, the overwhelming majority of women — including those with relatively young children — engage in at least some remunerated employment. And this long upsurge of employment for women has effectively disguised the steady decline in work for men, both by generating new sources of household income and by replacing men who once held jobs. Second, for complex historical reasons, a caste of men has arisen that finds it socially acceptable and financially possible to scrape by in an employment-free existence. Not only are these men not actively looking for work, but for the past two decades only a small minority of them have reported they are out of the labor force because they cannot find jobs (the classic definition of a “discouraged worker”). Thus, in effect, this flight from work has been possible to ignore because it has ostensibly been voluntary. Until roughly the outbreak of World War II, the overwhelming majority of conform working-age men in the United States were either working a paid job or looking for one. There was no third way for healthy, able-bodied males. In our America, by contrast, the taxonomy of employment includes a third category: neither working nor seeking work. The rise of the unworking American man underscores the deeply antiquated and misleading nature of our primary measure of labor-market health: the unemployment rate. By that hoary yardstick, the employment situation for prime-age men in 2015 and early 2016 looks pretty good. But the unemployment rate, which calculates the percentage of people in the labor force who are without work but seeking jobs, was devised in an age in which mass withdrawal of working-age men from the labor force was inconceivable. Between 1965 and 2015, the number of prime-age men neither working nor looking for work grew more than three times faster than the number in the workforce. Indeed, the economically inactive have come to eclipse the unemployed as the main category of men without jobs. By 2015, in any given month, there were on average three “unworking” prime-age men for each prime-age man out of work but looking for a job. At no point in the past two decades — not even during the Great Recession — have the unemployed exceeded the economically inactive among American prime-age men. America’s declining male labor-force participation rate is not typical of modern Westernized societies. While there has been some decline in the postwar prime male labor-force participation rate in all of them, the flight from work has been more extreme in America than in almost any other economically advanced democracy. Today, America is 22nd out of 23 in prime-age male labor-force participation, underperformed only by Italy. Purely as a matter of arithmetic, the collapse of work among American males is largely due to the rising numbers of men no longer seeking jobs. Between 1965 and 2015, the prime male exodus from the labor market accounted for fully seven-eighths of their total work-rate decline — and unlike withdrawal from the labor force at older ages, a mass withdrawal from the workforce in the prime of life cannot plausibly be attributed to retirement. Who are these seven million men who have left the workforce in what should be their prime working years? As one might imagine, a pool of seven million is large enough to include all sorts of people. But some groups of prime-age men were more likely to be not in the labor force than others. The overrepresented groups include the American-born (as opposed to immigrants), individuals with less than a high school education, the unmarried, those without children and blacks. This suggests that broad social forces are at work here. Such a formulation, however, can lead to the conclusion that individual prime-age men have no role in determining their life outcomes. And this is manifestly not the case. Consider race and ethnicity first. The residual legacy of prejudice and discrimination might seem to explain why prime-age male work rates and workforce participation rates are lower for blacks than whites. But this doesn’t explain why work rates and labor-force participation rates for white men today are lower than they were for black men in 1965, at the end of the Jim Crow era. 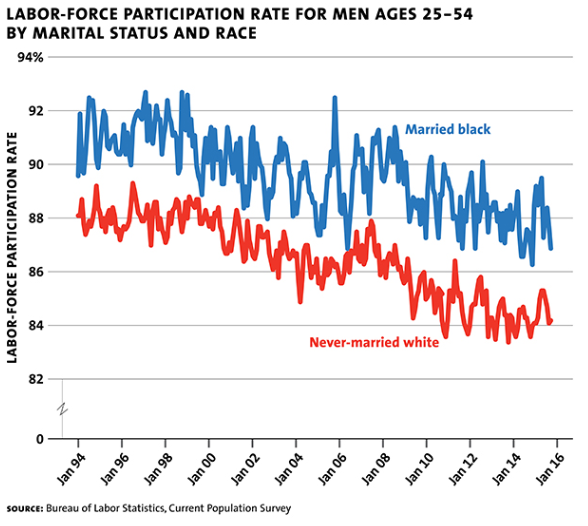 Nor does it explain why labor participation rates of prime-age married black men are higher than those of never-married white men of those same ages. Consider education next. Important as the advantages of education plainly are, we can also see how behavior and choice also affect labor-market outcomes for men. For prime-age men with less than a high school degree, labor-force participation rates today are roughly 20 percentage points higher for those who are married than for the never-married. So consequential are the correlates of marriage that workforce participation rates for prime-age men today are essentially indistinguishable for married high school dropouts and never-married college graduates. Now consider nativity. Regardless of ethnicity, prime-age male immigrants are more likely to be in the workforce than their native-born counterparts. In fact, native-born white men are now less likely to be in the workforce than black men born in other countries. Moreover, foreign-born prime-age male high school dropouts — a disadvantaged group if ever there was one — have labor-force participation rates very close to those of highly advantaged native-born male college graduates, with whom they arguably share very little save their exceedingly low odds of being out of the workforce. Why are married men and foreign-born men more likely to be in the labor force (and also to find work), all else being equal? A wedding ring does not confer innate social advantage in the competition for jobs; neither does a green card (as opposed to citizenship). Rather, marriage and migration decisions speak tellingly to motivation, aspiration, priorities, values and other intangible characteristics that do so much to explain real-world achievement. 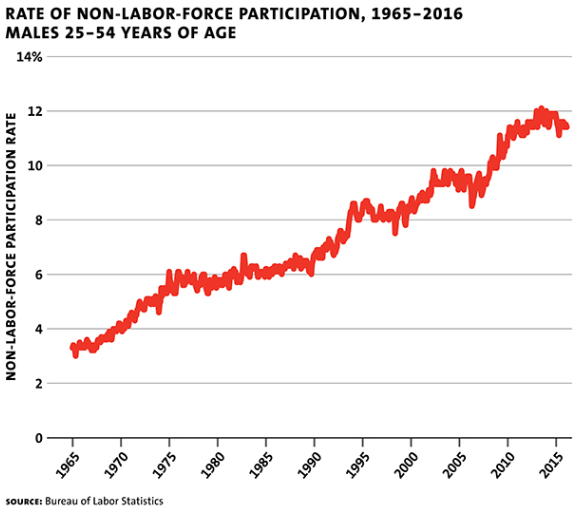 Why have prime-age male labor-force participation rates dropped so steeply over the past two generations? Economists are inclined to approach this question by parsing the problem into subsidiary components: demand-side effects (fewer jobs available), supply-side effects (less willingness to work at a given wage) and institutional effects (barriers to employment for those willing to work). Economists do not have a singular answer for why demand for lower-skilled and middle-skilled labor is falling. Possible causes include technological advances and globalization, including import competition and offshoring. … Some economists point to “skill-biased technological change:” advances that benefit workers with certain skills more than others. … These forces have, among other things, eliminated large numbers of American manufacturing jobs over a number of decades … leaving many people — mostly men — unable to find new ones. Most economists would agree that these structural changes have depressed the demand for labor — especially for less—educated labor — in the postwar era. The subtler question, however, is quantitative: how much of the overall men—without—work problem do these demand—side factors explain? There are reasons to suspect that structural changes may have had less impact than is widely believed. The first is the uncanny linearity of the decline in labor-force participation rates for prime-age American men: The great male flight from work has traced out something like a straight line downward for the past half-century, apparently almost totally uninfluenced by the business cycle or secular changes in the tempo of economic growth. Second, demand-side effects clearly do not affect all lower-skilled men. Today an extraordinary 24 percentage point gap separates foreign-born and native-born prime male labor-force participation rates for prime male high school dropouts. Then there is the curious question raised by regional disparities in prime male labor-force participation rates. One might expect that regional differences would diminish with time, as labor markets sought equilibrium after demand-side shocks. But state-level disparities in that group have been rising, and steadily so, for the past three and a half decades. 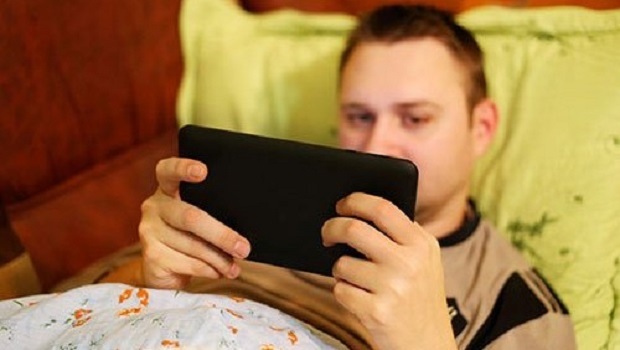 Moreover, some of the states with the very highest prime-male inactivity levels happen to be right next door to some of those with the lowest levels: West Virginia (20.3 percent in 2014) borders Maryland (8.7 percent), Maine (14.3 percent) borders New Hampshire (8.8 percent), and so on. What, then, is the evidence for “supply-side” explanations — changes in preferences and incentives that encourage men to withhold their labor? Even though uncorking prime-age men report practically no earned income of their own these days, they are not entirely without means. According to the Census Bureau, households in which a prime-age male was not in the labor force averaged $37,000 in annual resources in 2014 — just about the same as for homes with working men, and actually more than for homes of unemployed men. A better source for information on government benefits may be the Census Bureau’s Survey for Income and Program Participation. According to this source, as of 2013, over three-fifths of prime-age men not in the labor force lived in homes that relied on at least one means-tested program for income. Some 41 percent of these men lived on food stamps, while just over half reported using Medicaid, a noncash benefit program. Means-tested benefit dependence for these men appears to have risen substantially over the past generation. Since 1985, the proportion of homes with men not in the labor force that obtained at least one means-tested benefit jumped by nearly 20 percentage points — much more than for homes with prime-age men who were unemployed but looking for work, to say nothing of homes with working men in them. Disability benefits also constitute a major source of public support — and an increasingly important source of support — for working-age men not in the labor force. Alas, there is considerable uncertainty and even confusion about the true extent of the dependence of such men on disability programs. There is no central authority keeping track of America’s many disability programs (most notably Social Security Disability Insurance, Supplemental Security Income and veterans’ disability) and the many hundreds of billions of dollars every year that they dispense. But the Census Bureau’s survey does offer a glimpse. According to that survey, in 2013 some 57 percent of prime-age unworking men were getting benefits from at least one government-disability program. That share was nearly 20 percentage points higher than in 1985. Roughly a quarter of these same men reportedly received such benefits from two or more programs. Nearly two-thirds of prime-age men in that category live in homes that get at least one disability check. Moreover, there are reasons to believe that the Census Bureau survey’s numbers understate the true extent of such dependence. To be clear, prime-age men in America who are not in the labor force do not typically enjoy lavish lifestyles. But their living standards may not be as penurious as some assume, either. And the evidence suggests their living standards have been rising steadily. I do not contend that the greater availability of social-welfare benefits (including disability benefits) has caused the great male flight from work. What is incontestable, though, is that these benefits have in some measure financed it. Changes in mores and incentives — supply-side effects — are thus clearly part of the dynamic underlying the great male flight from work. And yet, even after taking account of the impact of demand-side and supply-side effects, we are still left with something of a mystery. America has the rich world’s very worst record of prime-age male workforce participation declines, even though many other affluent democracies have weaker growth rates (think of demand-side effects) and more-generous welfare states (supply-side effects). Surely something else must also be at play in this grim drama. That something is what economists wonkily describe as institutional barriers. Start with the fact that the past half century has seen an explosive rise in criminal sentencing and incarceration in America on a scale unlike anything witnessed in other Western societies in modern times. Today, the United States is home to a vast and largely invisible army of felons and ex-prisoners, overwhelmingly men of prime working age. These men are disproportionately high school dropouts, disproportionately native born, and disproportionately black. These ex-convicts fare very poorly in the labor market — and their diminished prospects constitute the key missing piece to the puzzle of understanding the collapse of work for men in modern America. Few of us today are aware of the staggering size of this group. In a forthcoming study, Sarah Shannon, a sociologist at the University of Georgia, and five colleagues estimate that America’s criminal class (people with a felony conviction or prison time in their background) roughly quadrupled between 1980 and 2010 — from 5 million to nearly 20 million. 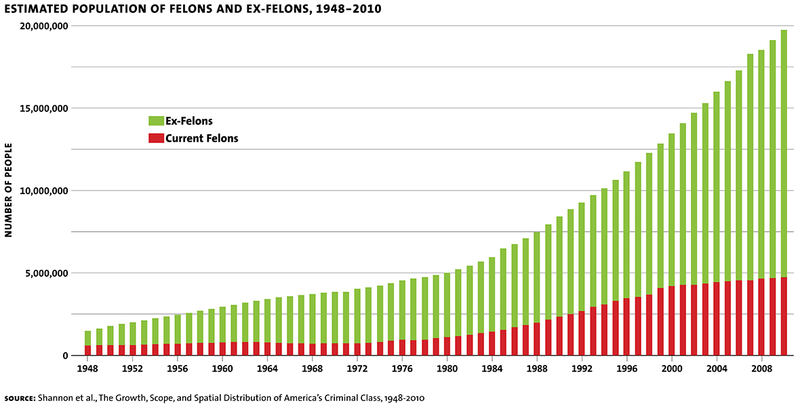 Given the flow of sentencing since then, we might expect that population to have topped 23 million by now. And since roughly two and a half million people are behind bars today, this means that 20 million released felons and ex-prisoners are living outside institutions. This implies that at least one in eight adult men in the at-large population has been sentenced for a felony. And the ratio for prime-age men could be even higher, given the upsurge of sentencing in recent decades. In light of these ghastly numbers, the obvious question concerns the employment profiles for men who have served prison time or have been convicted of felonies but not incarcerated. Try as one might, however, it is impossible today to glean such information from official statistics. The federal government simply does not collect data on their social or economic condition. This scandalous oversight helps explain why policymakers and researchers have paid so little attention to institutional barriers in America’s problem of men without work. For my own research I reconstructed employment profiles for sentenced men using nongovernment data. The National Longitudinal Survey of Youth, for example, asks respondents about delinquency, arrest and prison time in its considerable battery of interview questions. And since the survey began in 1977, some of the youths it has tracked are now well into their 50s. Given the arcane particularities of the survey, its employment figures are difficult to harmonize with official Bureau of Labor Statistics data. But the findings from NLS are stark, and absolutely unambiguous, nonetheless. 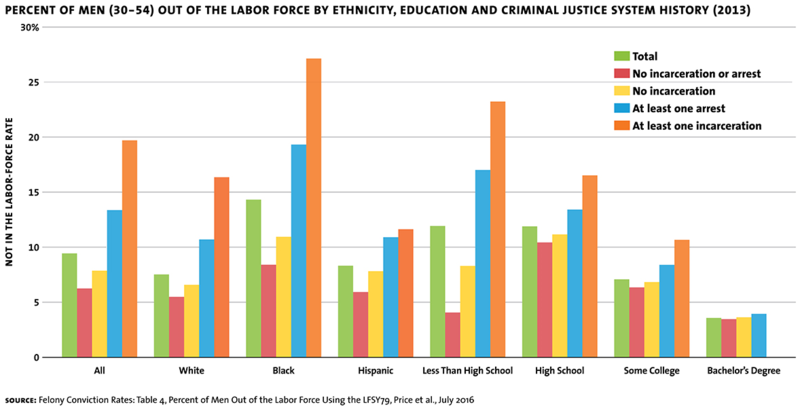 Regardless of a man’s age, ethnicity or educational attainment, he is much more likely to be out of the workforce if he has served time in prison than if he only has an arrest record — and also much more likely to be out of the labor force if he has an arrest record than if he has never been in trouble with the law. These relationships do not tell us why men who have been through the criminal justice system fare so much more poorly in the job market. There are multiple possible explanations — discrimination and loss of skills lead the list. But the numbers leave no doubt that America’s unique trends in criminality and criminalization are a critical part of America’s unique contemporary men-without-work problem. This problem demands attention and action. Reasonable, well-informed people may disagree about the factors that have been responsible for the great male flight from work, or their relative importance. There should be no disagreement, however, about its ominous and far-reaching consequences. Economically, the progressive detachment of ever-larger numbers of adult men from the reality and routines of regular paid labor can only result in slower growth, lower living standards, greater income inequality, higher social-welfare bills and larger budget deficits. Socially, the detachment compromises mobility, trust and cohesion — and much more since the incapacity of grown men to function as breadwinners cannot help but undermine families. Psychologically, it casts those who have been raised to view themselves as the strong gender into the role of dependents — on their wives or girlfriends, on their aging parents, on government handouts. Revitalizing American business’ job-generating capacities. 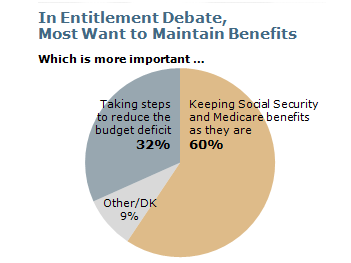 Reducing the disincentives to work in existing government-disability programs. Facing up to the enormous task of bringing released convicts back into the economy. I am not suggesting there is a one-and-only best strategy for tackling the problem. Quite the contrary: this should be a let-a-hundred-flowers-bloom moment. The first priority is to bring this invisible crisis out of the shadows and into the glare of public scrutiny — and to create the consensus needed to prevent it from slipping back into the shadows. As long as we allow the crisis to remain invisible, we can expect it to continue. Nicholas Eberstadt holds the Henry Wendt Chair in Political Economy at the American Enterprise Institute (AEI), where he researches and writes extensively on demographics and economic development.